The phase contrast microscope converts the differences of refractive indexes between two structures into levels of contrast, which are translated in differences of phase for the light waves crossing them. Therefore it allows the display of the transparent structures when their refractive index differs from that of their neighborhood. the 90º phase shift ring and the gray filter ring are placed in the objective. When the edge of a structure produces a sufficient diffraction, the light which is visible through it undergoes a phase shift in comparison to the other rays of light. Rings filter these out-of-step beams and its result on the image is a contrasting focus on the structure. 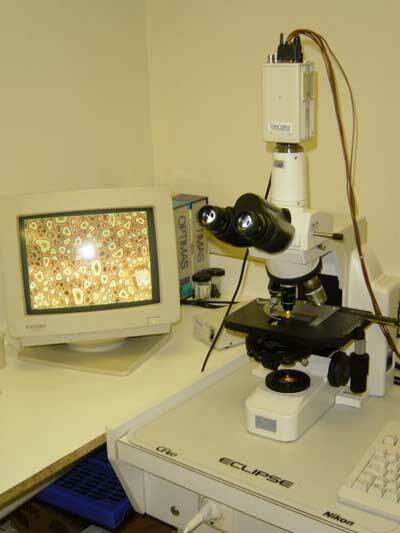 The phase contrast microscope is particularly used in bacteriology thanks to its ability to reveal small opaque objects. In the dental domain, it allows the study of the mobile bacterial flora, responsible for gingival inflammation, but also the highlighting of the oral protozoons of the periodontal disease or parodontitis, and thus allows to refine the diagnosis. Indeed, some authors, such as Paul Keyes, described the florae corresponding to each clinical case and identified the presence of entamoeba gingivalis in 100 % of the deep periodontal pockets, as well as the presence of trichomonas in the most acute infections. In the 1980s, this same report pushed the proposition of a treatment using the microscope with contrast of phase to eliminate parasites in a methodical manner. Mark Bonner reused, improved and structured this technique to offer the standards we follow in his publications and training seminars today. A small quantity of dental plaque is taken from the tooth wall, near the gum. It is placed between the blade and the small strip of the microscope, with a little saliva. Ours dentists in Lille (59000) and Neufchatel-Hardelot (62152 ) near Boulogne sur mer display directly on the connected screen the microbial composition of your dental plaque, bacteria and the potential parasites (amoebas, trichomonas, candida) and their mobility. - To clarify with the patient the evolution and the potential treatments' results thanks to the computed recording of the examinations. The use of the phase contrast microscope, following the indications of expert authors on this topic, enables us to apply a diagnostic and curative technique which not only detects periodontal problems prematurely, but also gives a reliable and fun basis to bring the treatments to a successful conclusion. The phase contrast microscope imagined in 1930 by the Dutch physicist Frits Zernike ( 1888-1966 ), enables the study of living cells, without having to modify them through staining. This major improvement brought his design the Nobel prize in 1953.